The TeamLiquid map contest has a long history of providing top quality maps and some of those have found their way into competitive use. Today we get to add to that legacy with the results of the latest edition of the TLMC. Last week we asked the community to vote for their favorite maps from our selection of hand picked finalists by the TeamLiquid Strategy team. You can find the complete list of finalists here. Now it's come time to announce the results of those polls. As always, the maps presented here will be considered for use on the ladder or WCS -- this doesn't mean than any of the maps below will definitely be used! But we are confident that if they are, they will carry on the TLMC legacy and be worth successors to their predecessors. It seemed cruel to not mention Solar Flare as one of the top maps in the team play contest. Literally a single vote separated it from third place. The map has four possible spawn locations for the teams (corners) which already makes it an interesting map. It also uses interesting map architecture to give each player their own natural which is separated from their team mates. This allows for some interesting strategies around exploiting the vulnerability of a split natural via timing attacks. A truly top quality map. 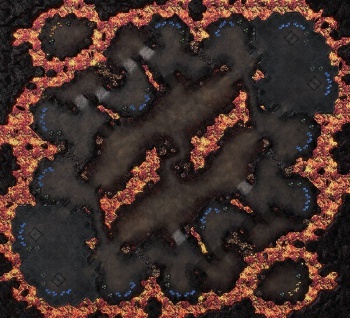 Lava Storm takes the split map concept to the extreme - splitting the map into two halves connected by small passageways. Players will have to make decisions about whether to focus their efforts entirely on one half of the map or to try and control both sides of the map at the same time. Air units will likely prove very powerful as they're able to pass from one side of the map to the other unimpeded. How players approach this map will create interesting and varied game play. While all of the maps in the team play competition were top notch, the competition for first was really a two horse race. Preservation started out in the vote very strongly, but the first place finisher was able to squeeze out a win. Preservation is a modern version of the classic 2v2 formula. Players have an in base natural and accessible bases close to each main, this means that players will be able to play a macro oriented game -- unlike earlier maps using this style. After the first bases the map progresses in a natural team-oriented way meaning this map will reward strong team synergy more than the other finalists. To top it off, not only is this map beautiful but it also has the blessing of Snute. The winner of the team play portion of the competition is also the only finalist to be actively used in current tournaments - currently Sacred Path is in use in TotalBiscuit's SHOUTcraft clan wars. The map is in use for a good reason, it's an exciting twist on how we should approach team play maps. Separate mains in 2v2 isn't a concept that has been explored at a professional or on the ladder in any significant way. This means that when people play this map they will have to devise new 2v2 strategies to best make use of the fact their allies are so far away. 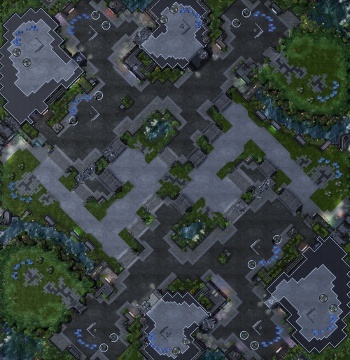 The map itself is inspired by the famous Brood War 2v2 map Iron Curtain by 송기범 (skb9728_CyGnus). There is a distinctive line down the center of both the BW original and Sacred Path. However, Sacred Path deviates from the original by firstly having a small opening which can be used earlier on and secondly making the entire line out of destructible rocks. This gives teams control over how they want to shape the battlefield and adds another dimension to the strategies teams will employ. IeZaeL has done a fantastic job creating a map which does justice to the legacy of the original map while providing enough difference to be considered a masterpiece in it's own right. Kamala Park, like waystation, is a two in one map. Players will always spawn in cross positions, but top left/bottom right (industrial) spawns will provide a different architecture than top right/bottom left (grassy) spawns on the map. The two different starting positions on Kamala Park play similarly to one another but the slight differences provide just enough variation without creating positional imbalances that greatly favor any single race. A good mix of open space and ramps in the center of the map will emphasize strong positioning when entering into any engagement. The high ground third base is an interesting aspect of the map. The "industrial" spawn position will find the high ground third more difficult to take, as the destructible debris needs to be destroyed in order to make it more easily defensible when taken early. In the "grassy" spawn positions, the third base is easier to take, with the destructible debris making it easier to hold against aggression. The high ground third also provides strong defensive options thanks to the ramp. Losing control of this high ground gives your opponent a very powerful forward position to attack you from making its defense absolutely critical in a macro game. Free airspace on the edges of the map is also limited making drop play more difficult to hide from your opponent, weakening harass oriented play on this map considerably. Second place in this contest also goes to Uvantak, which is a truly incredible feat. Innovation did not go unrewarded in this competition. Foxtrot represents quite possibly, the greatest push towards "non-standard" that doesn't rely on gimmicks, poor map design, or by providing any one race an overwhelming advantage over another. 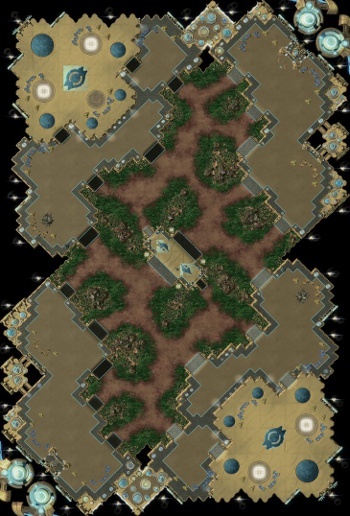 The map structure with two high ground lanes in the center is reminiscent of Cloud Kingdom, one of the greatest maps in StarCraft 2 history, and the winner of the first TLMC. The base layout is non-intuitive and provides for a lot of strategic depth. For now, we believe the map's main focus will be securing one of the main ridges on the map providing control over various attack paths and protecting most of your bases on the low ground. Keep in mind, there are no vertical spawns on this map, which might take some getting used to. Mining out a gold base does more than provide you with minerals on this map, it gives you an additional attack path. However, the gold base is extremely exposed, making the choice to take it a tactical one. Cross positions will also give a slightly different set of tactical choices and attack paths compared to spawning horizontally making this map almost like a two in one map without relying on top/bottom vs left/right asymmetry. 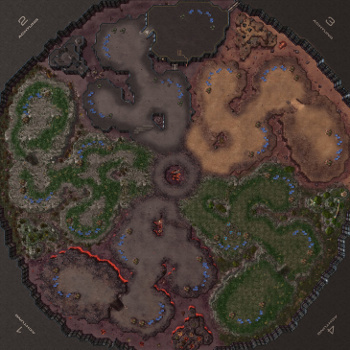 While perhaps not as pretty as the previous two maps, the community was clear that it was seeking a map to radically challenge the norms of 1v1 maps. While Foxtrot subtly pushes the game in interesting directions, Biome is anything but subtle as a 5 player map which breaks all the rules. With forced cross positions, you will always have two bases to scout in order to find your opponent. Rotational symmetry often leads to concerns regarding the third and fourth bases favoring one spawn over another. Surprisingly, Biome seems to break this curse by making everyone's third and fourth bases relatively easy to take and forcing cross spawns. Well, with easy third and fourth bases you might assume that the games are boring with a lot of turtle play however the air space in this map ensures that this cannot happen. 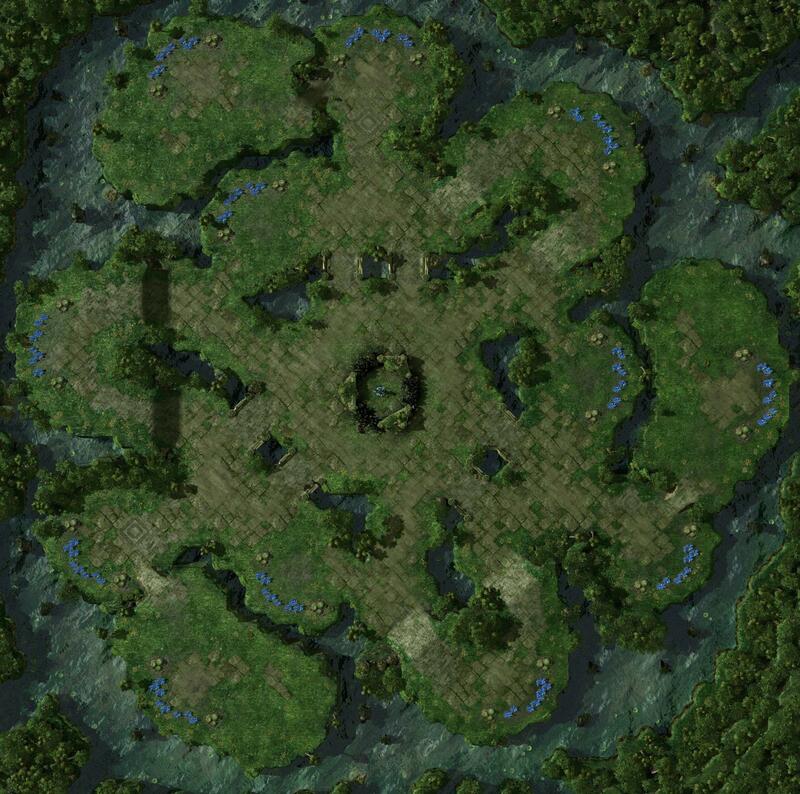 You cannot simply contain your opponent to 4 bases and take the rest of the map. The 360 degree air space you need to defend poses a challenge to turtle play we haven't quite yet seen in StarCraft 2 to date. Warp prisms, dropships, and mutalisks will always be in the back of your mind while playing on this map. The large center also provides a lot of options to outmaneuver any attempt at a contain. Playing this map is all about controlling the center area while staying protected against the gigantic airspace around your four bases. Congratulations NemRaC on your achievement! Thank you to everyone who entered, voted or left a comment in any of the TLMC threads. As always it's an honor to be able to host this contest and we look forward to doing it again in the future. Congratulations to all of the winners. I think we learned something today - that this would have been on ladder if it looked like Testbug. I'm terribly glad you guys liked my maps so much, all those years making maps are worth it! And if they get chosen by blizzard i hope you have fun playing them! Btw my maps can be found under custom games with the usual KTV tag in the 4 servers, you will find different versions of Kamala Park and Foxtrot Labs, including the original version of Kamala Park with the in-base natural and lack of ramp! The maps are Gameheart ready and are open to edition for any one that wants to check them out in the map editor. I'm so pumped by this! That I almost forgot to say congrats to NemRac & IeZ for getting the first places! And thanks to TL & the Strategy team for this competition! Sorry Uva, you would have done better if only one of your maps was in the top 5. Congratulations to all map makers. I hope to see Foxtrot and Kamala Park in tournament rotation at some point in the future. I'm floored. I thought Uvantak was totally getting first and second with Kamala and Foxtrot (either order, they are pretty close). They seemed the clear favorites. This is now officially a figure skating competition! I'm not surprised, nor entirely happy to see Biome win, but it was to expected after all, since the popular vote will always go to the map that stands out the most superficially, due to how the vote splitting works. On the other hand I really like Sacred Path, though its ascension was also influenced by the same sort of thinking. Of course, ultimately, the results of the contest don't really matter, since Blizzard decides which maps go into the map pool and which don't, and they don't need to consider the results of the vote at all, but I really wish the voting system was more representative (maybe asking users to give a rating to each map?). Oh well, gratz to the top placers anyways. yeah it's a 5-player map and that's new and all, but..
well.. hope i wont see Biome on the ladder..
anyways congrats to the winners! I feel so bad for NemRaC right now. Jesus, the guy wins, and everyone shits on his map. Honestly, I think Preservation and Biome are awful maps and that I could do better. Annoyed to see they did so well. Why do you need to be so harsh? Geez.